Many phone plans and calling cards will let you down at the most inopportune times — the times when you need to connect with your friends and family abroad. For example, let’s say a loved one in Bristol has an emergency, and you need to reach out to them immediately. What happens if your plan doesn’t offer unlimited¹ calling to Bristol? You’ll have to keep that important chat to a minimum and get off the line before the cost gets too high. That never has to happen again. With Vonage World®, calling Bristol from USA won’t have to be a wallet-breaker anymore. That’s because we’ll send you our VoIP adapter, the Vonage Box™, at which point you’ll be able to make calls over the Internet for a low monthly fee. From then on, you can reach any landline in Bristol as part of the package. 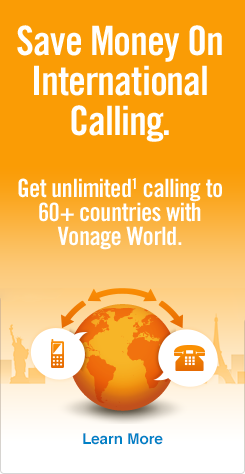 Vonage World also lets you make unlimited¹ calls to UK landlines and in over 60 countries plus mobiles in more than 10 others. When you want to call a cell phone in Bristol, however, there’s a separate (but small) per-minute rate added on. The point is that cheap calls to Bristol are waiting for you. Click on the Vonage World link to find out more. Then, dial 117 — the Bristol area code (landlines only*). Lastly, enter the local 7-digit Bristol phone number. *Just a reminder, when you’re calling cell phones in Bristol, you’ll need to enter the US exit code, then the UK country code, and then “7” before you dial the rest of the 9-digit number. You may need to reach cities other than Bristol. If that’s the case, find out alternate city codes at our how to call the UK guide. Bristol is one of the UK’s warmest cities thanks to its southern location. Famous as a seaport and trading town, Bristol also has strong ties to the aerospace industry and the military thanks to the defense contract work that takes place nearby. Like so much of the UK, the modern and the historic are often juxtaposed on city streets. Enjoy a stroll along the harbor or just plant yourself in one of Bristol’s charming waterfront restaurants. Whatever you choose to do, you’re sure to have a good time in Bristol!